Let's not get hung up on trying to figure out a use for this thing, and just admire it for what it is: awesome. 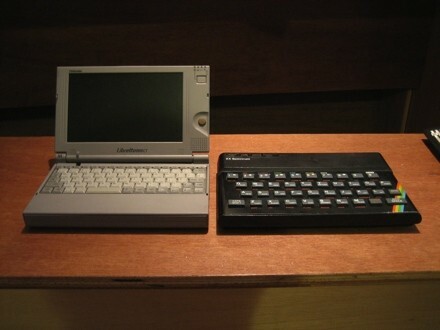 Jim built this "Spectrum ZX Laptop" out of an old ZX Spectrum 48k and a Toshiba Libretto 110, using the Libretto for innards and the screen, while the Spectrum serves as a case and keyboard. The "laptop" gets a couple hours of batter life, and naturally Jim is running Linux on here -- he plans to emulate some old ZX Spectrum games with it, but mostly it's just art. A shot of the two machines in their original states is after the break.